Notes: I wanted to make the sleeves shorter and a bit less poufy so that they would be better for my proportions. I also changed the construction so that there would be a crisp transition between the sleeve and the cuff, with no flaring on the cuff. 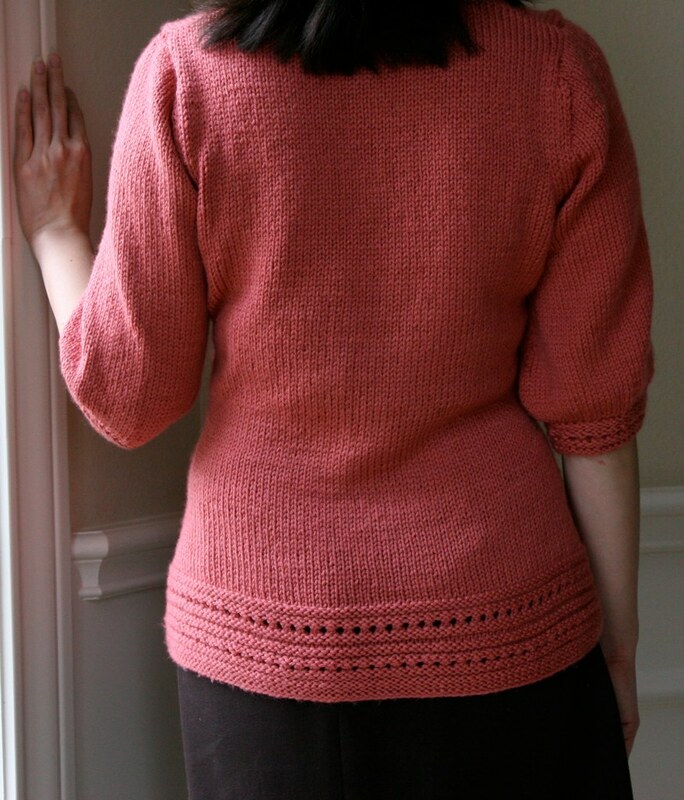 For my size, I cast on 39 stitches with the largest needles. On the next row, I doubled the stitch count by Kfb of each stitch. 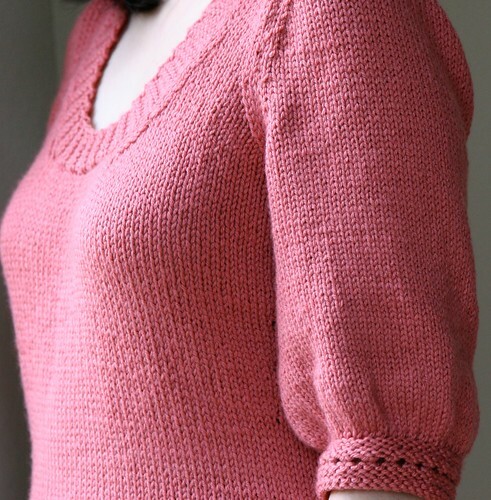 I then continued on the sleeve, making decreases at intervals, so that by the time I reached the sleeve top, I had the same number of stitches as the pattern (there was 1 extra stitch since I had an even number). 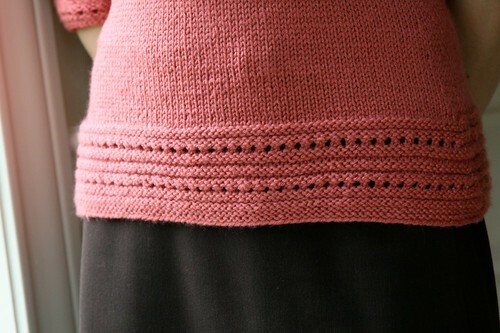 The sleeve top was shaped according to the pattern, with the extra stitch being boung off in the last step. Then, I used the smallest needles to pick up 42 sts for the cuff. On the next row (WS), I just knit. And from there, I worked through row 11 of the cuff pattern and then bound off knitwise on the next row. 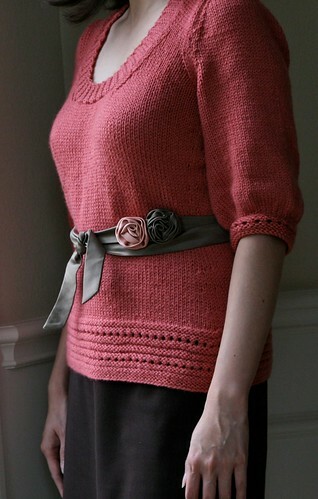 The only other modification I made was to knit this in the round up to the armholes. 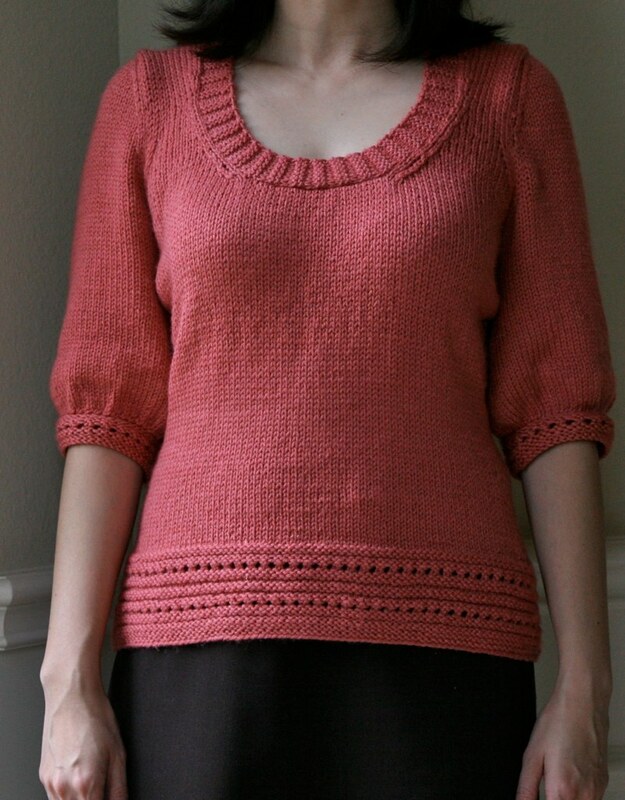 My gauge got very sloppy in the back-and-forth sections near the neckline–loose and wonky, and not all of it blocked out. I’m not sure what was going on with that, so personally, it was not my best knitting. This yarn is so soft and comfy, but it does shed a lot. I am bummed, too, that in the bag of 10 that I bought, there was one with a dye defect–it looked very uneven. Sadly, I didn’t notice this until I had knit up the entire ball (I was on a plane and the lighting was bad). I also had one ball that had 3 knots in it.